Royal Australian Air Force (RAAF) today welcomed the 10th and final C-27J Spartan into service during a ceremony at RAAF Base Richmond. Minister for Defence, Senator the Hon Marise Payne, and Minister for Defence Industry, the Hon Christopher Pyne MP, congratulated RAAF on completing the upgrade to the Australian Defence Force’s comprehensive fleet of air mobility platforms. Minister Payne said the Spartan was a highly versatile aircraft that would enhance battlefield airlift capability of the Australian Defence Force. “The Spartan provides flexibility to Defence operations, allowing us to land at airfields that are smaller or unsuitable for our much larger transport aircraft like the C-130J Hercules and C-17A Globemaster,” Minister Payne said. Minister Payne said the Spartans are currently operated by No. 35 Squadron at RAAF Base Richmond, and would relocate to RAAF Base Amberley in early 2019. “The relocation to Amberley will allow No. 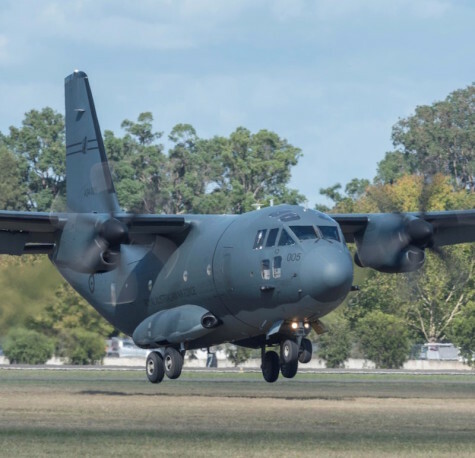 35 Squadron to work from facilities purpose-built for the Spartan, and to be more responsive when deploying across Australia and into the Asia Pacific,” Minister Payne said. Minister Pyne said Australia’s defence industry would provide important sustainment support for the capability. “Northrop Grumman Australia has been selected to provide through-life support to the fleet,” Minister Pyne said. “In addition, Fibre Tech Solutions has delivered a cargo restraint system for use on board the Spartan and other air mobility aircraft, increasing the speed and ease of loading and unloading these aircraft. Over the last 12 months, the Spartan has supported Whole-of-Government efforts in the 2017 Papua New Guinea parliamentary elections and during international exercises in New Zealand, Guam and New Caledonia. Initial Operating Capability for the Spartan was declared in late 2016, and Final Operating Capability is scheduled to be declared in late 2019.